25 Natural Remedies from Around the World! Most women seek the best methods for flawless skin. Below, we've compiled the ultimate collection for natural skin remedies from around the world. Adding these beauty regimens to your day may just give you the results you've long been seeking. • Rub ice cubes on the face to stimulate blood circulation, giving you healthier and glowing skin. • Alternate between a hot and cold face pack. This will give you a healthy complexion, increase blood circulation, improve skin elasticity and saturate your skin with moisture. Repeat this alternating technique several times. • Use lemon juice to reduce inflammation. Apply lemon juice over acne to make pesky pimples appear smaller and less red. • Try red grapes for glowing skin. The antioxidants found in grapes will make your skin look radiant. To do so, make a paste by mixing red grapes with two tablespoons of flour. Apply to the face and leave for 10 minutes before washing it off. The mask is best applied in the morning. • Eat foods that are high in antioxidants. Foods such as fish and berries. • The heat of a sauna is also an effective method that will remove toxins from the body. • Use rice water. This will cleanse you face, stimulate collagen production and give your skin a smoother texture. To do this simply grind white rice in a blender, add warm water to create a paste with a yogurt-like consistency, than wet your face and use your fingertips to massage into your skin. Rinse well. 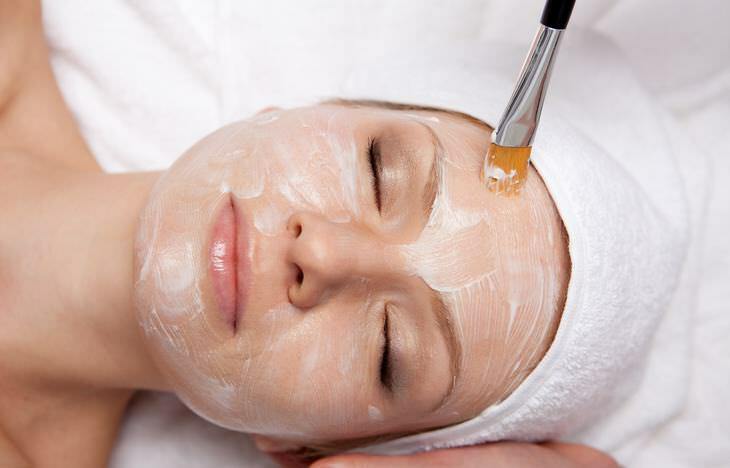 • A daily facial massage will help improve the skin's elasticity, infusing it with oxygen. • Carrot juice is a wonderful home remedy that will help get rid of pimples. Fresh carrot juice is packed full of beta carotene which will help soothe acne. • Potatoes are used to get rid of dark circles under the eyes. Chop a raw potato into thin slices and lay over your eyelids for 10 minutes. • Snail slime is one of the most popular skin remedies in Korea. Its considered to have good healing properties and contains collagen and elastin. • Coconut oil or argan oil are also used before applying a cream or facial mask. • Alternate your beauty products regularly to help prevent your skin from getting accustomed to certain ingredients. • Quince-based lotions and masks are ideal for oily skin. Simply grate the quince on a fine grater and add a whipped egg white to it. With light massage movements, apply the mixture to your face and leave for 10 minutes. Then wash the mask off thoroughly. • Use a jade roller on your face to improve blood circulation and skin tone. • A sea salt skin scrub is used to remove toxins from the body. For better results combine 1/4 cup of sea salt with 13.5 fl oz (400 ml) of seaweed powder, 1/2 cup of massage oil, and 10 drops of lavender oil. • Herbal and berry teas are believed to be a great way to cleanse your skin. Let the berries steep for at least 10 minutes before applying to your face. Goji berries in particular are a rich source of vitamin C, minerals, antioxidants, and amino acids. • Honey and a lemon face mask is used. Lemon reduces bumps on the forehead while honey soothes the skin. Combine the two together and leave on the skin for 20 to 30 minutes a day. 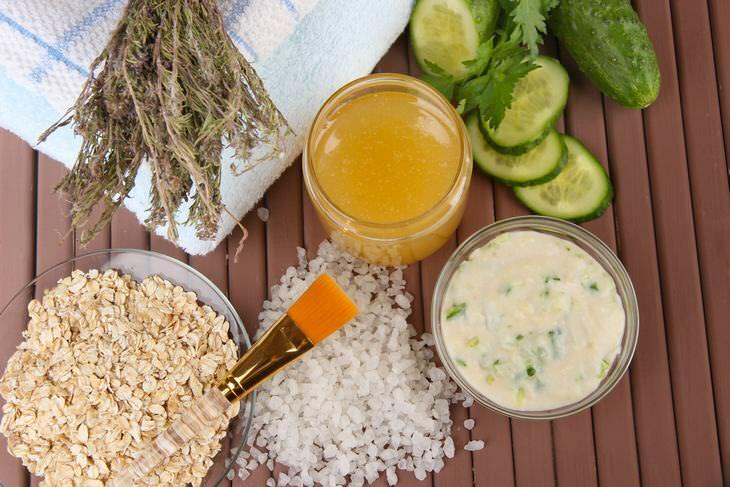 • An oatmeal scrub is used to scrub and cleanse the skin as well as tighten pores. • Try steaming your face by pouring 2 tablespoons of chamomile flowers into 2 cups of boiling water and steam your face for about 20 minutes. • Use iced water to promote skin cell renewal and to stimulate the synthesis of natural collagen and elastic fibers. • Mix one part turmeric powder with one part raw honey and apply the mask twice a week. This mask has strong antibacterial and antiseptic properties. • Massage olive oil into the skin to help make your skin healthy, supple and moisturized. • Try a white clay mask used to cleanse, nourish, and whiten the skin. • Aloe vera creams are also used to actively moisturize, nourish and protect your skin against premature aging.